The classical discovery site, which ceased activity at the start of the year, has shifted its archive to the Deutsche Grammophon website prior to final shutdown. The farewell message went out today. 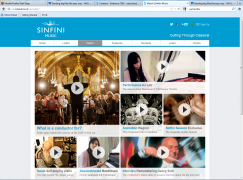 At Sinfini Music, it has been our ongoing mission to ‘cut through classical’ and help you discover the very best of classical music over the last three years. We’re lucky to have had so much encouragement from all of you, and help and input from the world’s most creative musicians and organisations along the way. From 14 March we’d like to recommend that you continue your musical discovery with Deutsche Grammophon, the world’s premier classical record label – already an online beacon for classical music fans and a rich source of information via their YouTube page, Facebook and Twitter channels, website, newsletter, exclusive fan area and much more. We’ve been working closely with Deutsche Grammophon, featuring video performances from Anoushka Shankar, Daniil Trifonov, Avi Avital and interviews with Anna Thorvaldsdottir, Mahan Esfahani and the Oscar-nominated soundtrack composer Jóhann Jóhannsson, who is new to the DG label. DG have an enthusiastic team who regularly update their channels with information about new releases and the rich discoveries to be found in their vast recorded catalogue. They also offer a dedicated artists’ section and a fan area where you can get a monthly newsletter service, take part in their exclusive weekly Listen & Discover sessions and even grab the odd prize in the process. You’ll still be able to access all of Sinfini Music’s expertly curated classical playlists on PITCHED – so make sure you save www.pitchedmusic.com to your favourites. The journey is only just beginning, so head over to Deutsche Grammophon and continue your musical quest! I was so hoping the farewell note was a B flat. Sic transit glori, may we read you again in the Blogosphere in the sky.